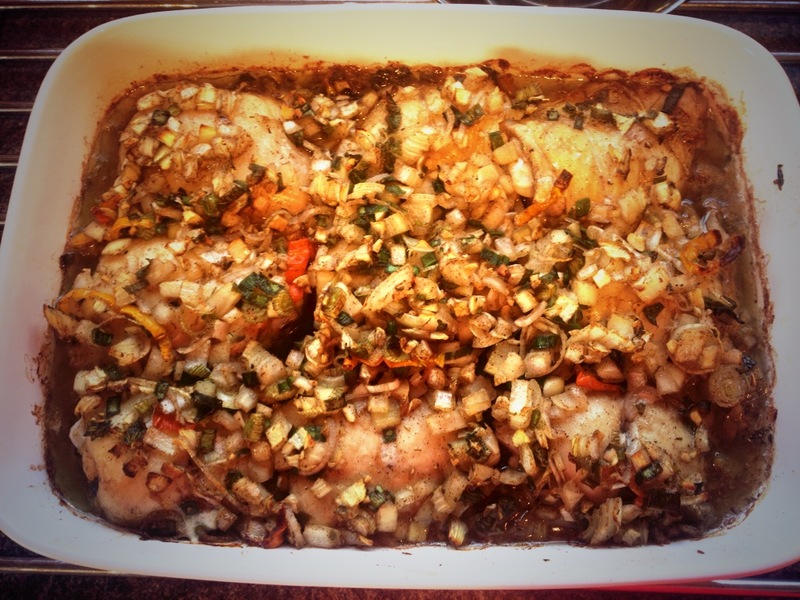 Now, I’m not going to lie, this isn’t entirely my recipe… It’s my boyfriend, Tyron’s. This was the first thing he ever cooked for me and I had never had it before but I loved it! 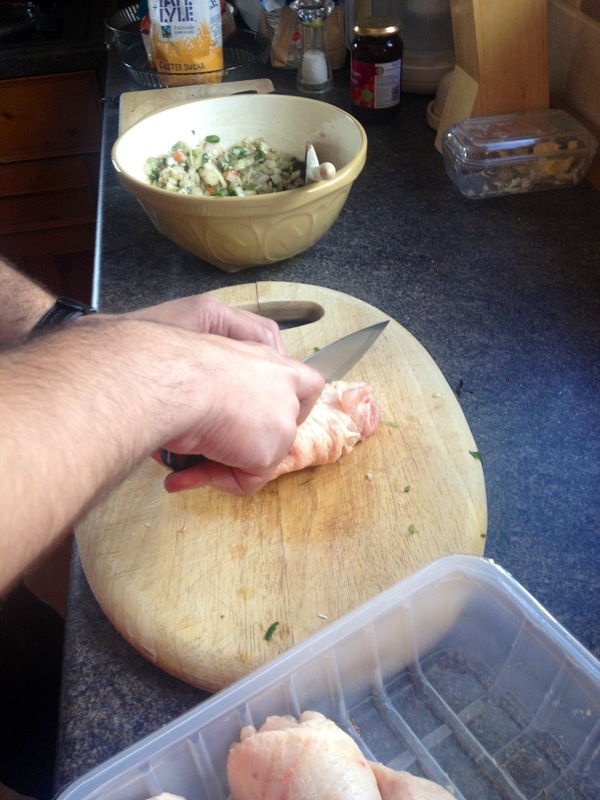 So last weekend I got him to cook it again for my parents so that I could play sous chef and see how its done. Having been enlightened to the wonderful world of jerk chicken only a few months ago its quickly become a firm favourite. Some of you may be put off thinking you’d never like this because it’ll be too hot (especially when you see the number of scotch bonnet chillies we put in it) but its really not. 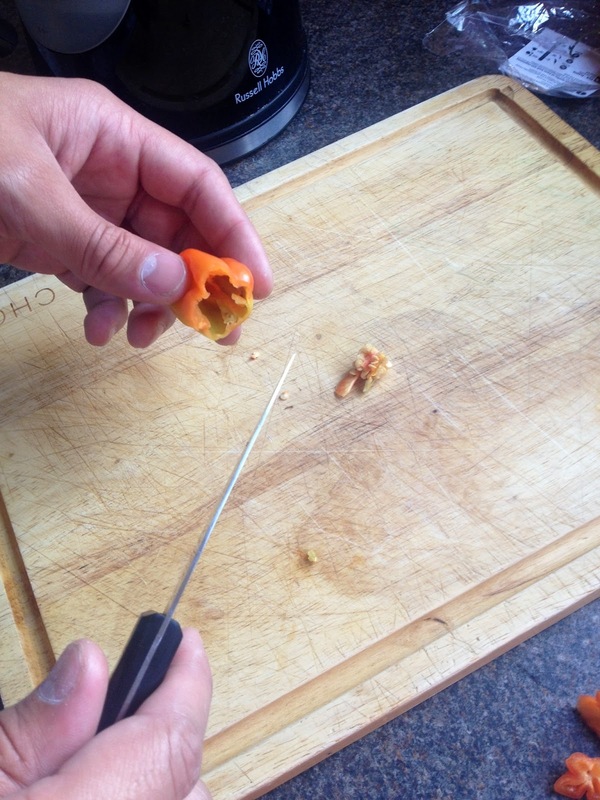 We removed all the seeds from the chillies which takes out a lot of the heat without losing the taste of that chilli. My Mums not big on spice but she loved this. It gives you just about the right amount of heat for the flavour to come through and leave a bit of an after taste without burning your mouth or blowing your head off. You could blend this sauce in a food processor if you wish to make it smooth but I quite like it chunky and I like to mix some of the sauce and the veg in with the rice on the plate. 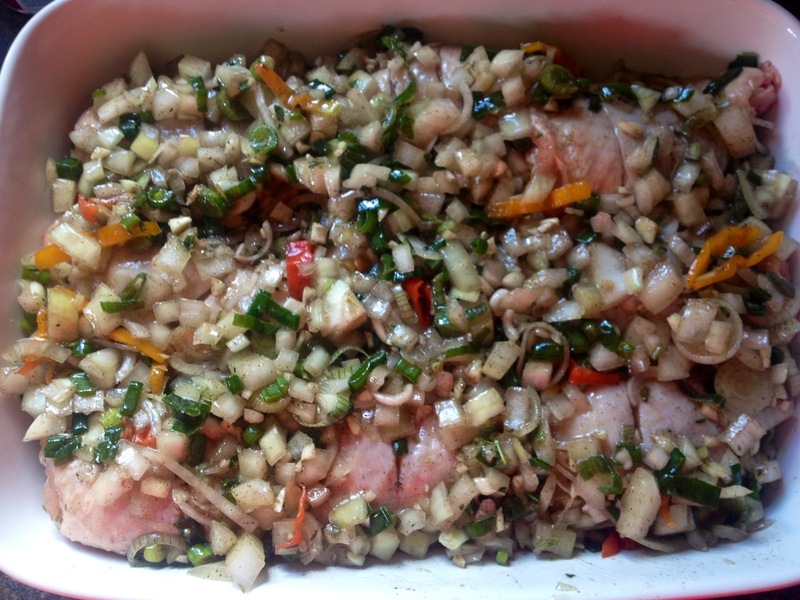 I’m told there are loads of variations on the jerk seasoning so maybe your family do it differently but I’m assured this is a very authentic Caribbean recipe, sticking to the basics and not messing around too much with the ingredients. And Tyron’s Jamaican grandmother loved it and said he’d done it justice so I don’t think you can top that seal of approval! 2. Add the oil, herbs and spices and mix well. 3. 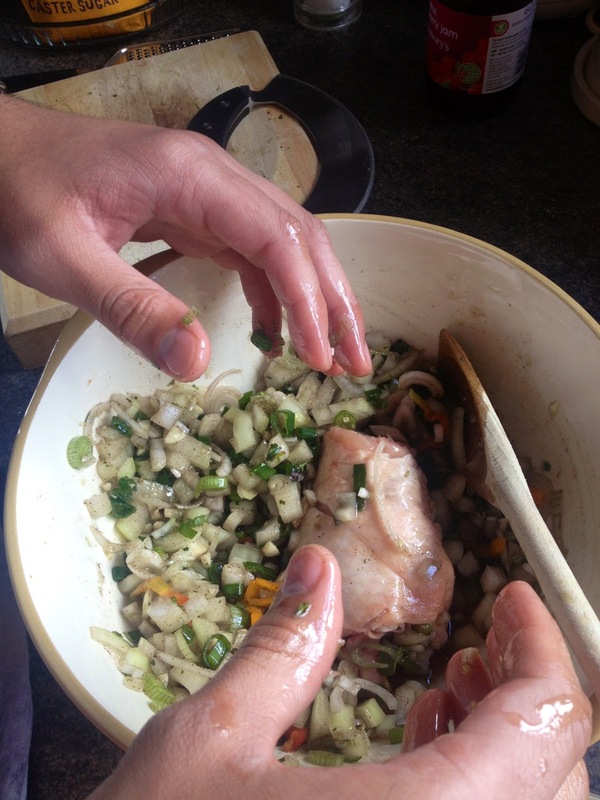 Slice into your chicken pieces to ensure the marinade penetrates the meat. 4. Cover the chicken in your jerk marinade ensuring it gets under the skin and into the slices. 5. Place in a dish and cover with the remaining jerk seasoning. 6. Cover with cling film and leave in the fridge over night. 7. 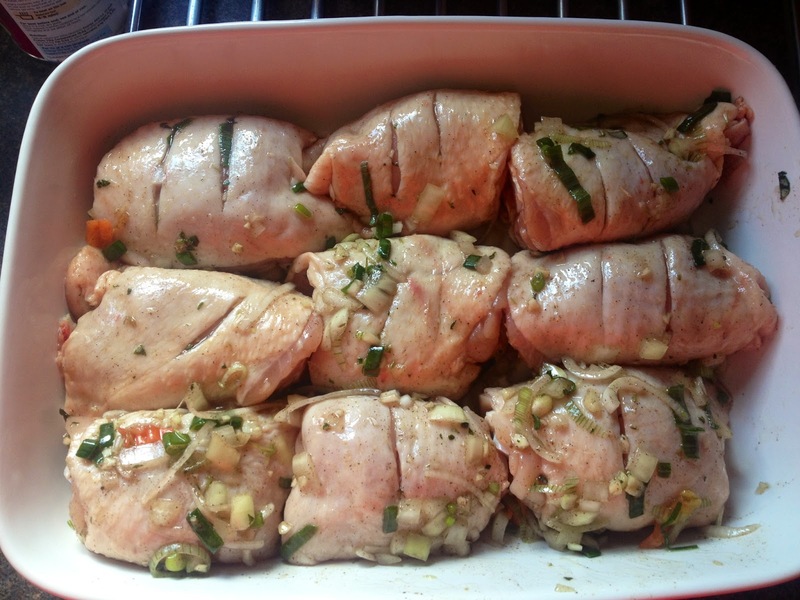 Remove chicken from the fridge and preheat the oven to 160°C. 8. Transfer the chicken and all the sauce into an ovenproof dish if it isn’t already in one, and cover with foil. Bake for an hour. 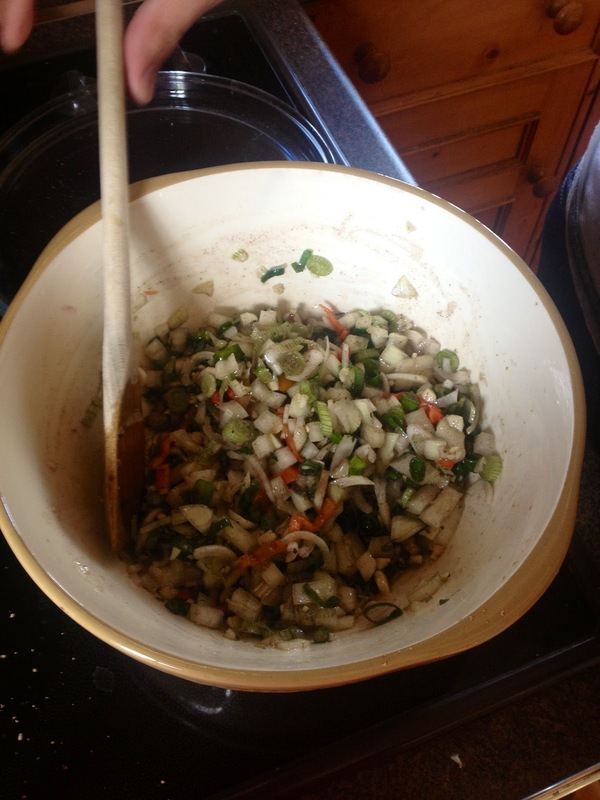 In the mean time you can start preparing and making the dumplings. 9. 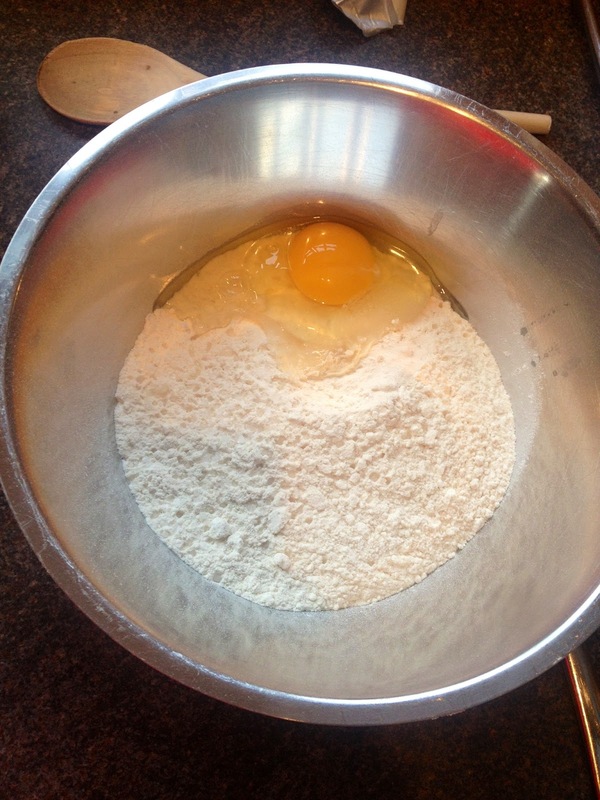 Place the flour, salt and egg in a bowl and begin to mix with your hands. 10. 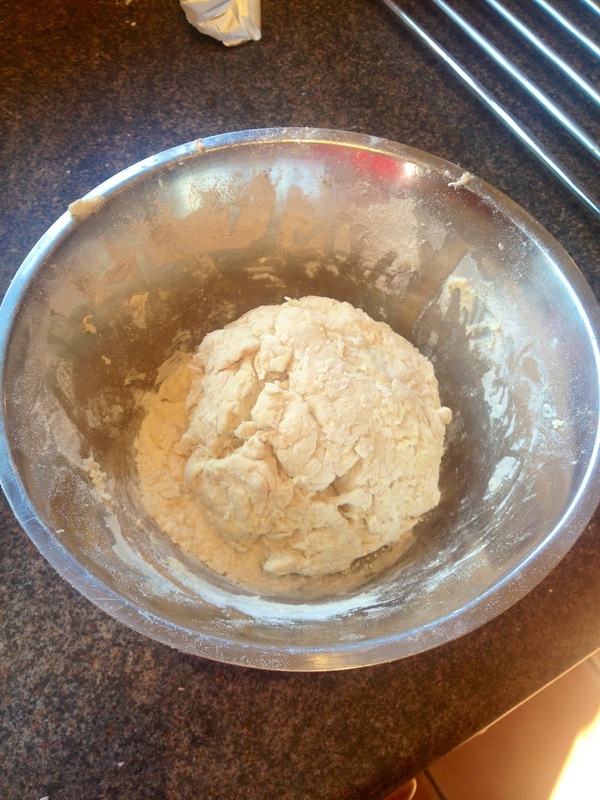 Gradually add the water until quite a stodgy dough begins to form. You might not need all the water, try not to let the mixture get too sticky and wet. If it does add a little flour. 11. Break sections off and form into little 2 inch balls. 12. 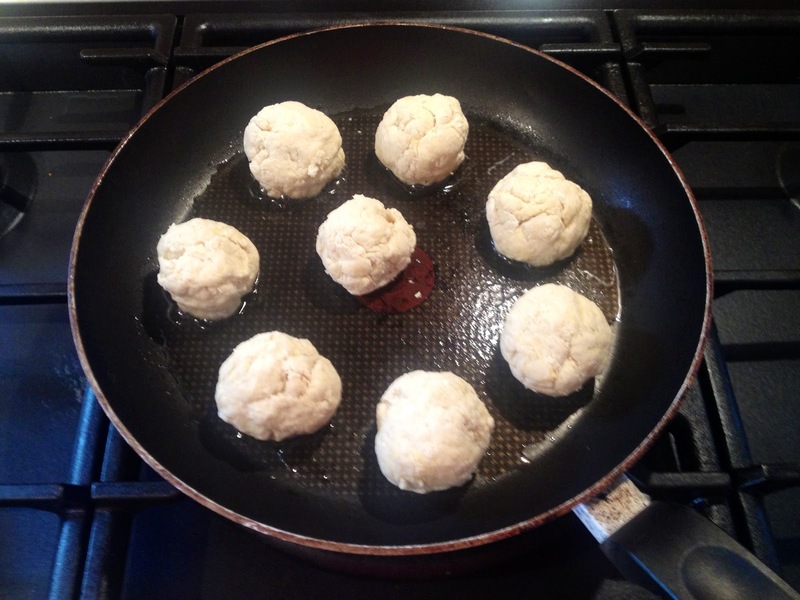 Heat some oil in a pan and shallow fry the dough balls, turning as you go until they’re golden on all sides. 13. Set aside and cover until you’re ready to serve. 14. When the chicken has been baking for an hour, turn the heat up to 200°C and bake for a further 20-30 minutes or until the skin is crispy and golden. 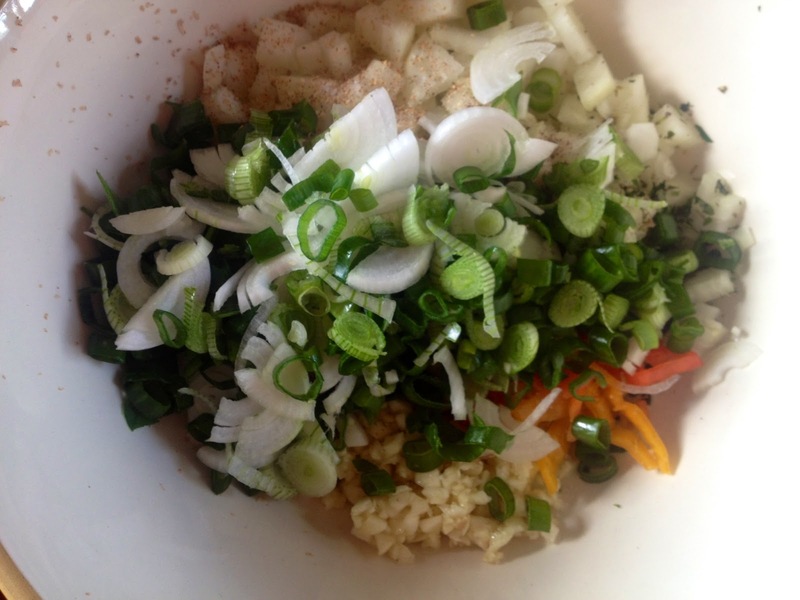 Now’s the time to cook the rice. 15. Rinse the uncooked rice thoroughly to remove as much starch as possible. 16. Place rice, water and coconut milk in a saucepan and bring to the boil. 17. When the liquid begins to boil, turn down to a simmer, cover and leave for approximately 10 minutes until all the liquid has been absorbed and the rice is light and fluffy. 18. When the rice is cooked drain the beans and stir through. 19. By now the chicken should be done and you can get ready to dish up. 20. Remove chicken from the oven and it should be looking golden, crispy and delicious. 21. 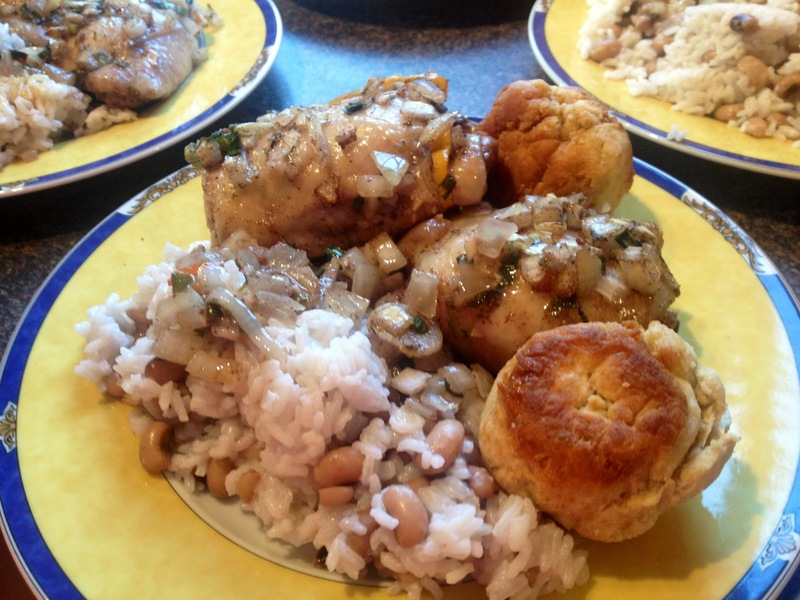 Serve a generous helping of rice with 2 chicken pieces and 2 dumplings per person. Pour some of the remaining sauce from the chicken over the rice and tuck in!